John Ronald Reuel Tolkien, a very talented writer, is famous for having created such a literary genre as fantasy. All his books are real masterpieces, and many having read them once, want to read them again and again. Warm-hearted and exciting adventure stories, involving people, elves, dwarves, orcs, goblins, wizards, and, of course, hobbits are in Tolkien's accounts. But not only fantastic beings were concocted by him. Both philologist and professor at Oxford University, he knew many ancient and modern languages. Thus, a new world - Middle-earth, along with its geography, its history, and several languages appeared. The history of this world goes into the depth of millenniums and stretches four epochs starting from the act of creation. J.R.R. Tolkien was born on 3rd January 1892 at Bloemfontein in the Orange Free State. When he was four years old his mother, Marry Suffield, and his younger brother Hilary, went to England. At that time his father was ill and soon died of rheumatic fever. After his father's death the family lived at Sarehole, on the south-eastern edge of Birmingham. Ronald spent his childhood there and later scenes from this area would be depicted in his pictures and writings. Another tragic event occurred when J.R.R. Tolkien was 12 - the death of his mother who died of diabetes. He and his brother Hilary became wards of a priest at the Birmingham Oratory. The boys attended King Edward's School in Birmingham. At school Ronald was interested in Classic as well as Anglo-Saxon and Middle English. At that time he began to develop his linguistic talent by creating his own languages with grammar and history. Not surprisingly that Tolkien was First in English Language and Literature at Exeter College. J.R.R. 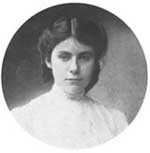 Tolkien was married to Edith Bratt. He had known her since they had both lived in the same house in Birmingham. Ronald loved Edith and continued to do so despite being forbidden by Father Morgan to contact her when he studied at college. Considering that it would ruin Ronald's career, Father Morgan would not give his consent to an early marriage. Tolkien was commissioned in the Lancashire Fusiliers and participated in the battle of the Somme. After the war he obtained a post on the New English Dictionary, and began to write the mythological and legendary cycle which he originally called "The Book of Lost Tales" but which eventually became known as "The Silmarillion". By that time the Tolkien's family consisted of four children (three sons and a daughter) and more than anything father liked to tell his children about mythical beings - elves, hobbits, etc. At first such stories were simply fairy tales. And the first book, which made him famous worldwide, "the Hobbit" (published in 1937) was written in the genre of a fairy tale. The book was a huge success and the public demanded a sequel. Thus, a popular trilogy "the Lord of the Rings" came into being. Although the greatest master of fantasy passed away, he left the door open for anyone to an enchanting world of his stories, the key to which is love, kindness and loyalty. These are the qualities that help Tolkien's characters to win over Evil.